Hello and welcome to the 168th instalment of the SWD. On the one hand, SDF forces have entered Nahdah neighbourhood, northwest of Raqqa city. On the southern districts, SDF reached the school in Nazlah Shahadah district. Furthermore, YPG has announced that several of its members have been killed in recent Raqqa clashes. 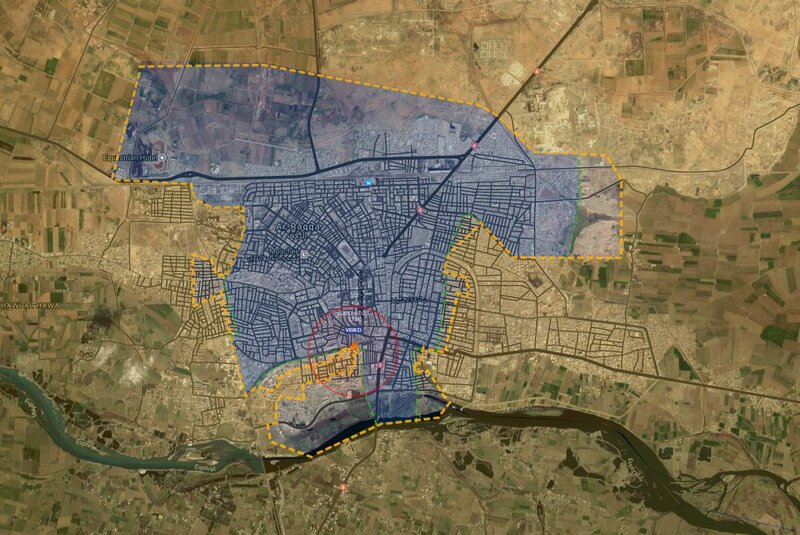 Although, SDF forces had advanced further deep into Shahadah district and by now control 85% of the neighbourhood. On the other hand, ISIS clashed with SDF forces near the old Mosque in southeastern Raqqa. Amaq news published an SVBIED operation in Shahadah neighbourhood against the US-backed forces with unknown results. Amaq also announced the execution of three SDF fighters near the roundabout in Shahadah district. Tiger Forces and tribal fighters continued their advance against ISIS forces on the south bank of the Euphrates river by taking control of Ghani Al-Ali, al-Joubilly villages, al-Rabyeh, and took control f the Al-Magala Kabira (al-Mughla al-Kabira) town, and its bridge, creating two ISIS pockets. The Brigadier general “Mushin Jamieh”, leader with 5th corps, has been killed during battles with ISIS in Raqqa countryside. Several civilian casualties in a bombing aimed to target a meeting between tribes in mount al-Has in Aleppo southern countryside. Apparently, the attack was done by an ISIS suicide bomber and targeted several Ahrar Sham, HTS officials, and local tribal leaders. Turkis-backed forces and YPG forces exchanged shelling on the northern side of the governorate. The latter targeted the town of Kaljibrin, while the Turkish-backed FSA shelled the village of Ayn Daqna. Martyr USama Suno battalion announced the renewal of its allegiance to Ahrar al-Sham in Idlib region. Turkish government released a statement regarding the beating at the border. The announcement reported the soldiers responsible for beating Syrian refugees to be detained and the initiation of juridic proceedings. Moreover, the statement also mentions that the four individuals that crossed the border illegally have been deported after a health check. The full statement can be found here in Turkish. Jaish al-Izza field commander (FSA) Killed with other three fighters during clashes against SAA in northern Hama countryside. On the Eastern Salamiyah front, Bustan Forces and Al-Kameet Men captured Marina Hill suggesting that next target will be the village next to it. South of the aforementioned front, SAA shelled with an intense artillery bombardment some ISIS position early in the morning. The GEneral Suheil al-Hassan visited the SAA units that will storm Uqayribat on the following days. These units will receive support from some Tiger units. The Field Commander Firas will be directing the battle towards Uqayribat, planned to push toward Raqqa and then to Deir ez-Zor. Government airstrikes targeted Houla town in Homs pocket and injured a civilian. 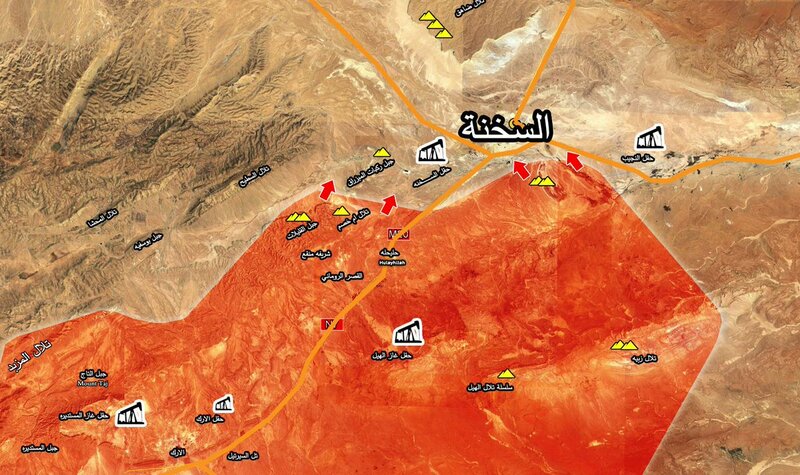 Regarding the battle for As Sukhnah, SAA forces and allies have made some advances towards Sukhnah city. The Euphrates Hawks tribal forces group accomplished their first operation around the city by capturing some hills around the area and managed to kill an ISIS sniper. Furthermore, the fighters managed to reach the older Shuaitat points. 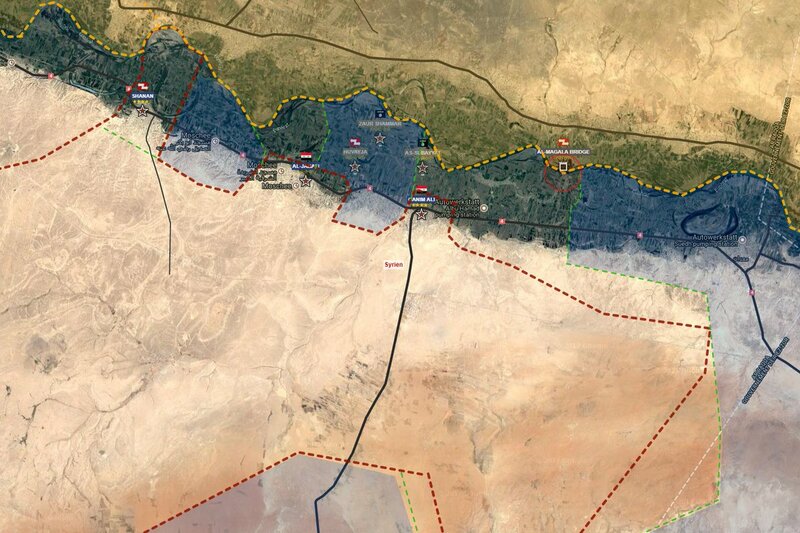 With these advances, SAA and allies now control the south-west areas of Sukhnah, as well as the surroundings of Hayl field, and find themselves in a position to storm the city. ISIS military commander in Sukhnah city has been killed by SAA. SAA advanced in Rajm al-Sabun, 11 km east of Hail, south to Sukhnah, and found extensive ISIS tunnels. The RT and Sputnik journalist Khaled al-Khateb (@KhaledgAlkhateb) has been killed by ISIS ATGM targeting its car. Although, contradictory reports can be found on the location of the accident as other sources suggest the incident took place in eastern Hama governorate. Government forces carried out two air strikes on Al-Marj area in Eastern Gouta. Other air strikes and heavy missiles hit happened in Ayn Tarma and Jobar. Jaysh Khalid bin Walid informed about a successful raid against Southern Front fighters in Western Daraa killing three fighters. SAA and National Defence Forces dug a 280 m trench in the Cemetery area in Deir ez-Zor city and cut 1 of ISIS main supply routes between the Cemetery and Tharda valley. Although, the terrorist group still has another alternative supply route. Up to nine civilians have been killed by CJTF-OIR strikes on Abu Kamal city. ISIS claims to have killed 4 Iraqi soldiers north of Baghdad. ISIS fighters killed and wounded several Iraqi soldiers after storming a building and detonating IED vests in the building. On the 29th of July 2017, CJTF-OIR has conducted 12 strikes in Syria. CJTF-OIR‘s main focus in Syria is Raqqa region where they did eight strikes supporting SDF‘s operations against IS destroying seven fighting positions and three vehicles. Other areas where four air strikes occurred are Abu Kamal (Al-Bukamal), Al-Shadaddi and Deir al-Zour, destroying five ISIS oil stills, four oil tanks, an ISIS headquarters, an ISIS tactical unit and a staging area. The full report on CJTF-OIR strikes conducted in both Syria & Iraq can be found here. For those of you interested, you can follow me on my personal, controversial twitter @alextorrell where I constantly tweet about different issues and conflicts.